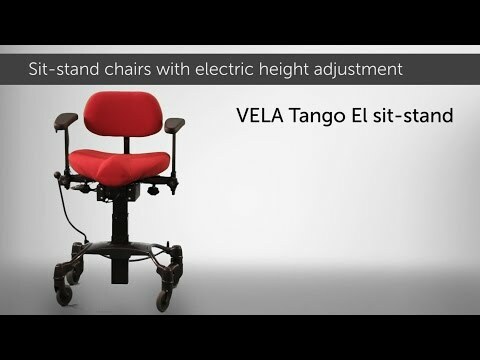 The VELA Tango El Sit-stand Chair is a customised chair for users who require support and safety while standing and, at the same time, need electric height-adjustment, e.g. due to reduced strength in their legs. People with stiff hip joints, short thigh bones, obesity or stability problems for whom a shallow seat with raised lip provides optimum support. Users who require support and safety while standing/sitting and also need electric height-adjustment to get into and out of the chair. The S150 seat (B:46xL:32 cm) is an extra shallow seat with a heavily padded, rounded front edge for better blood circulation in the legs. The chair allows the user to get close up to their work. Ergon armrests (W:9xL:30 cm) with extra long armrest bar (41 cm) for electrically adjustable chairs are useful for tall users who require good support from the armrests when getting into or out of the chair. They are also beneficial for users with a long upper body combined with short arms, e.g. users with dwarfism. An electric brake, operated using an easily accessible flip switch. This brake is suitable for users who are unable to operate a brake stick. An electric brake can help to ensure the user is as independent as possible – an advantage for carers as well as the user. The electric brake is available for the 2-wheel as well as the 4-wheel brake frame. An arthritis switch makes it easy to operate the electric height adjustment. This is useful, for example, for people with reduced strength, poor mobility or pain in the hands.